The new England kit, designed by American sport kit manufacturer, Nike, which is set to be worn for the first time against the Republic of Ireland on 29 May at Wembley, has been unveiled. England and Arsenal midfielder Jack Wilshere tweeted a picture of a student from his old school wearing the shirt. 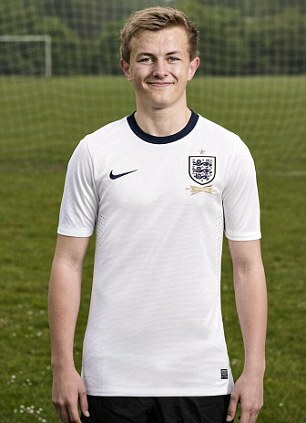 Wilshere tweeted just before lunchtime on Monday: 'Like this kid, my England dream began here, so he was first in #theshirt – England’s new kit from @NikeFootball'. 'This is where my dream of playing for England started and it's great to be back here to see a new generation playing with the same passion,' said Wilshire. Fan reaction was mixed at the unveiling with many stating on Twitter that the kit looked too German with its very dark collar, but there was also praise for the simple design. The kit will make its first appearance against the Republic of Ireland on May 29, and then again in Brazil later that week. 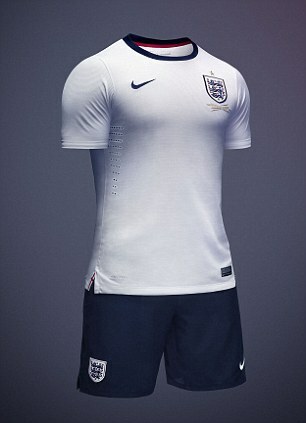 Nike have taken over from Umbro as the Football Association's kit supplier this year. The deal with Nike lasts until 2018 and brings a 60-year association with Umbro to an end. The deal with sports giants Nike, which runs until 2018 includes supplying kit and match balls to all of Club England’s 24 football teams, including the men’s national teams, women’s, Futsal, disability and amateur, and sponsorship and support of St George’s Park, the home of the National Football Centre in Burton-upon-Trent. It makes a new era for the Football Association following 60 years of a relationship with Umbro, which ended after the match against Montenegro in March.
. I think Umbro did a nice job of the last one. Not to sure about the gold. What am I saying they could be Pink all that matters is the Cup!